Plenty of configurable information for a Minecraft HUD. Better HUD 1.8 is a mod that handles add plenty of options to our Minecraft HUD. In total, we have 28 options or “widgets” that can be placed in our HUD to show on-screen information that we believe important. Among its options are things like a compass that will indicate at all times the direction we’re going, durability both weapons and tools, and the various elements of our armor, time of day, number of days since we started the game and FPS. To access the customization menu only have to press the “U” key. If you want to change the key to access this menu, you can do it from the control section in “Miscellaneous”. 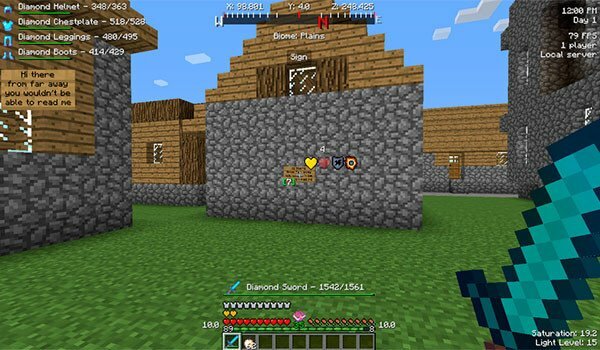 How to install Better HUD Mod for Minecraft 1.8? Customize the information you want displayed on your game screen!